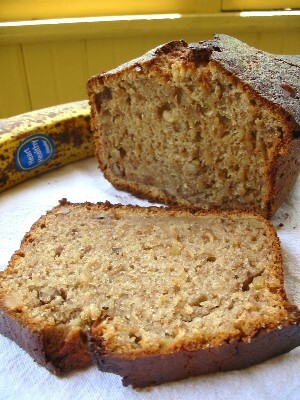 Best Low Sodium Banana Bread EVER! Banana bread is perhaps the most-beloved of all quick breads, and the variety of incarnations seems endless. Some recipes have nuts, others don’t, and a select few call for dried fruit or chocolate chips. There are versions made with butter or sour cream, or even jarred baby food, and some are leavened with yeast. The only real constant is that they all without fail contain some form of banana. Creating my own recipe took a little doing, but this is IT! A moist bread with intense banana flavor, a smidgen of spice for interest, nuts of course, and some whole wheat flour for heart. Yields one loaf. Serves 16. Preheat oven to 350 degrees. Grease and flour a 8.5 x 4.5-inch (approx) loaf pan and set aside. In a large mixing bowl, combine the mashed banana, sugars, vanilla and cinnamon. Add the eggs, one at a time, beating well after each. Stir in the yogurt and oil. Add the baking powder and baking soda and mix. Gradually stir in the flours, scraping the sides of the bowl to incorporate. Last, stir in the chopped walnuts. Pour the batter into the prepared pan. Place pan on the middle rack in the oven and bake 1 hour and 15-20 minutes. Bread is done when a tester inserted into the center comes clean. Remove pan from oven and place on wire rack to cool. Allow bread to cool slightly before tilting pan and removing loaf. Serve warm or cool. Store leftovers in an airtight container. 15 Responses to Best Low Sodium Banana Bread EVER! FANTASTIC! EZ TO MAKE AND REALLY GOOD, MOIST AND FLAVORFUL. TASTES SAME OR BETTER AS I’VE HAD IN A BAKERIES I’VE VISITED. I would like to know the Nutrition facts. I’m excited to try this recipe but I am having a difficult time finding the 2 listed low sodium baking sodas. If I need to can I substitute regular baking soda for these two ingredients?? Sorry you’ve having such a tough time finding the low-sodium versions of baking powder and baking soda. If you can’t find them, by all means substitute regular baking powder (do look for aluminum free if you can find it!) and regular baking soda. 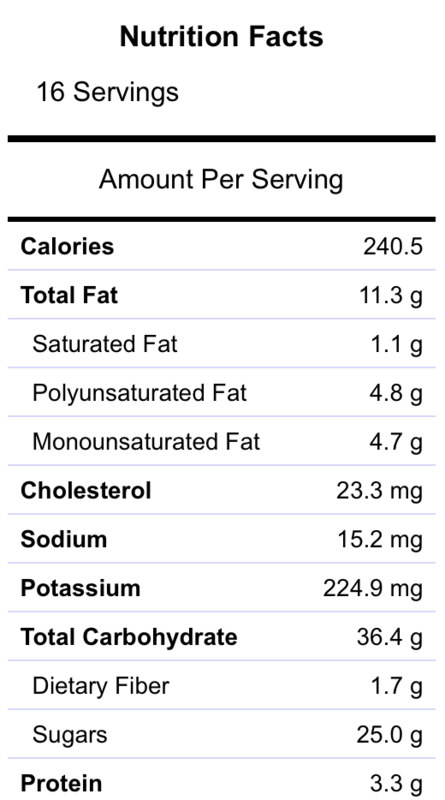 The sodium content will be higher than the calculation above, but better for you to make your own at home than buy even higher-sodium commercial banana bread! This bread was the first thing I made with my very first Ener-G b. soda purchase and it was absolutely delish! So very moist and tasty! Have you ever baked these as muffins? I’m wondering about the baking time. YAY! Wonderful to hear, Rosa! That makes me so happy. I’ve not baked these as muffins, but I bet they’d be delicious. I’d suggesting keeping the baking temp the same (350 degrees) and filling the muffin cups only 2/3 full – not sure how many it will yield (could be more than 12?) Set your timer for 20 mins and keep checking a “tester” muffin till it’s baked fully inside (toothpick test in middle – if necessary, add add’l 5 mins bake time (as needed) until done). Best of luck!! And if you have good success, please do report back and let us know the best time for muffins and how many!! I am going to make this today and am going to add some crushed pineapple. I will let you know how it turns out! Ooh yummy!! Hope it worked out wonderfully, Julie! Is the Ener G low sodium baking soda the same as their baking soda substitute? I can only find the substitute.